Bacteria belonging at least five genera of bacteria cause soft rot in pepper and include species of Erwinia, Pseudomonas, Bacillus, Xanthomonas, and Cytophaga. The most aggressive and important soft rotters are Erwinia carotovora subsp. carotovora and E. chrysanthemi. Symptoms of soft rot start as water-soaked lesions which rapidly spread and develop into deterioration of the fruit into a slimy, foul smelling mass. The bacteria responsible for soft rot produce cellulolytic and pectolytic enzymes that rapidly breakdown cells walls. Bacteria that cause soft rot are ubiquitous in the environment and are associated with surface water, the rhizosphere, and soil. Warm and moist weather is highly favorable for infection. Spread of bacterial diseases is most often the result of human activity-pruning and propagation procedures, movement of soil and plant debris by machinery or on feet, overhead irrigation, and the application of insecticides and fungicides under pressure. 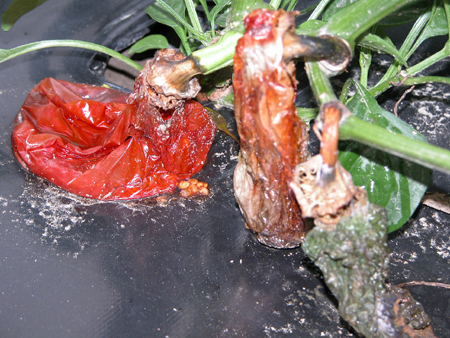 None of the soft rot bacteria can penetrate intact fruit surfaces but rather they invade peppers injured by wounding,insect stings, and sunscald. The peduncle (main stem attaching fruit) and associated lobed calyx (fused flower parts) are highly susceptible and are often the point of initial attack. Soft rot bacteria invade the fruit from these plant parts. Moist conditions increase the succulence of these plant parts and their susceptibility to bacterial soft rot. Excess nitrogen fertilization has also been associated with increased susceptibilty. Soft rot can occur in the field before harvest and can be spread at harvest (and into storage) by workers, contamination of harvest containers or packing equipment, and post harvest handling practices. Avoid conditions in the field that favor disease development such as excess nitrogen, excess irrigation, insect stings or other wounding. Avoid harvest during rainy periods. Avoid harvesting and other mainpulations when the foliage is wet or cold. These conditions are highly favorable for excessive injury and distribution of the bacteria. Clean and sanitize harvest containers and processing equipment daily. In wet dumps or spray washes, maintain a free chlorine concentration of at least 100 ppm at pH 6.0-7.5. Remove free water from fruit by a combination of air drying and cooling. Cooling should be completed before shipping or storage.